I know, it’s not a very catchy title, but it is descriptive. A large part of my current job is speaking at conferences and talking about feature flags, systems resiliency, and whatever else I can talk people into. And part of speaking at conferences is applying to lots and lots of conferences. But how do you keep track of it all? That’s a lot! I complained about the problem, and Thursday Bram suggested Airtable, as a beautiful mashup of a taskboard and a spreadsheet. Since then, I’ve suggested it to several other developer relations people and I know some of them are using it. I’m now paying for the full version, which gives me the calendar view, and that’s been my killer feature. It really helps me to be realistic about how conferences stack and overlap with each other. This is the main view. I have it sorted so that conferences that are over or that have not accepted any talks from me are not showing, because I really only need to know about what is coming or may be coming. I’ve grouped it by the Talk Accepted dimension and then the date. At a glance, I can tell what I have coming, and what talk I’m giving (if I remembered to enter it, because I’m sometimes not great at that, as you can see. I can drill down into any talk title for a card that has a bunch of information on the talk. Frequently I include the proposal I submitted here, along with information about how far along in the process of creation the talk is, all configured by me. Have I drafted it? Made slides? Practiced it on my own or in front of other people? Further down on the talk card, I can see all the conferences I submitted the talk to and whether it was accepted or not. That gives me a good overview of whether a talk is “wearing out” or less likely to be accepted than another kind of talk. It’s useful information. All of those features are available at the free level, and it’s powerful enough for most people, but did I mention I apply to a lot of conferences? More than there are weeks. You probably don’t need the full version. This view right here is worth everything I spend on Airtable, and I’m certainly not a power user. But it tells me about conflicts in a way that has been very hard for me to predict from just looking at dates. 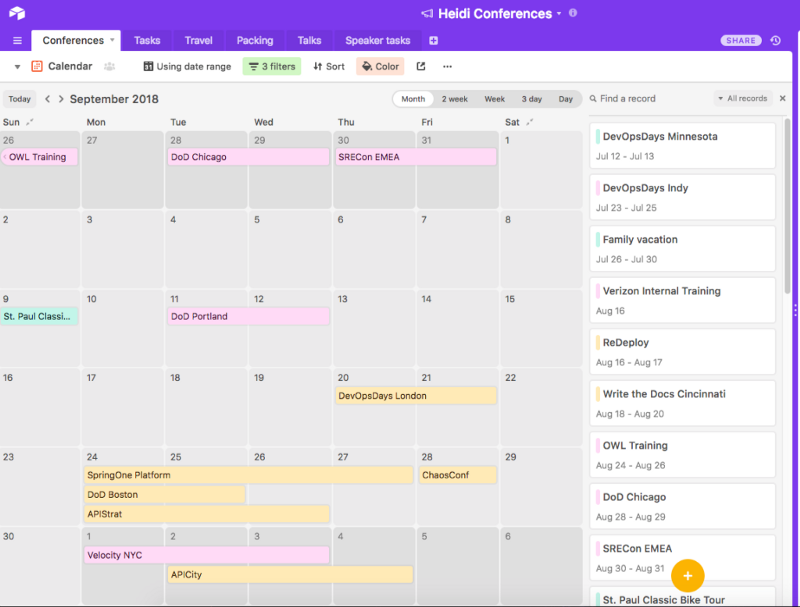 (If we were all good at predicting conflicts from dates and times, we would not have Outlook Meetings Calendar, is what I’m saying) Now I can tell ahead of time that I can only accept one of those three conferences starting on the 24th, and that allows me to be a more polite speaker. Sometimes it’s possible to look at this and make better arrangements. For example, DevOpsDays Chicago is a great event, but it’s literally the day before I need to be in Dusseldorf. Rather than discombobulating myself or the conferences, I can ask now, months ahead of time, to speak on the first day of DevOpsDays Chicago and toward the end of SRECon. That gives me an error budget for weather/flights/etc. Most conference organizers are lovely about helping me out with these things. Airtable is a super useful tool for being able to organize data when some parts of it are fixed and some parts change and you need to be able to keep the associations together. There are bigger, more heavyweight databases that can do that, of course, but this is a pretty, friendly, usable implementation of the theory. If you’re interested in trying it yourself, here is a link to the original workspace I set up: Heidi’s Conferences. Feel free to give it a spin or fork it for your own needs.